From local authorities to private companies, transport facilities to Royal Parks, the London Filming Partnership (LFP) brings together diverse players in the city to collaborate on making London as film-friendly as possible. Together, we support over 1,000 media projects in the city every year. If your organisation is involved with the production of media in London in any way, you are encouraged to join the LFP. Membership is free and comes with many benefits. In addition, a wide variety of individual locations such as the London Eye, Imperial War Museum, Somerset House, the Old Royal Naval College and various hotels are active partners. 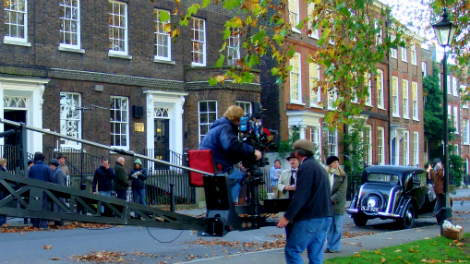 All share a commitment to making London a welcoming place for production while ensuring the city's residents enjoy the economic benefits of filming in the capital with minimal inconvenience. Is your organisation involved in facilitating the creation of film, television, advertisements, animation or games in the city? Organisations of all stripes are encouraged to join the LFP today to connect with the community and create a better, united film-friendly city. Contact london.partnership@filmlondon.org.uk to become a member of the LFP. Membership is only available to organisations, not individuals. Individuals interested in industry networking and events should sign up to our Locations Crew Diary.